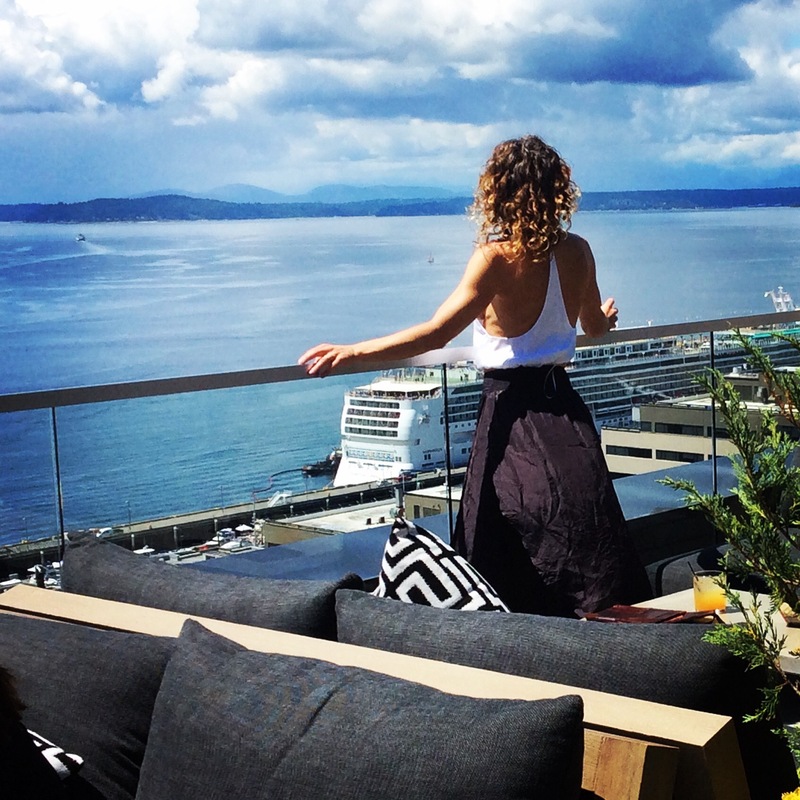 Welcome to the hottest rooftop bar in Seattle, The Nest, sitting atop the Thompson Hotel and overlooking the newly extended Pike Place Market with expansive views of the Puget Sound. Seattle has officially found its inner LA vibe, and I just found my newest watering hole. And OMG, what a watering it is. The sprawling terrace offers three unique bars; one full bar nestled inside glass panels at the entrance, one placed alongside a grill in the center of the rooftop, and then there is the bubbly bar – serving up the Nest’s signature drink in a golden feathered bowl called none other than “The Flamingo.” Could it be touched by a bit of Miami flair as well? Poured over ice from the center of the flamingo’s belly, the perfected concoction of Moët & Chandon Champagne, Courvoisier 12 Year, Absolute Elyx and Don Q Gran Añejo Puerto Rico Rum entices the arrival of summer. This weekend’s reopening party was cast in perfect Seattle summer day fashion, and I could not get enough. Quite simply, the small bites and snacks conceived by Thompson Seattle Executive Chef Derek Simcik and the cocktails are beyond delicious. The architecture designed by Seattle’s own Tom Kundig follows in his signature look of a clean, elegant structure made of glass, steel and metal that takes complete advantage of the beauty of the surrounding space. Plus, the people at The Nest are welcoming, friendly and happy. In conversation two different servers they told me (completely unprompted) that “you just can’t have a bad day here!” I think they’re onto something of a fabulous motto! No? If you had the chance to check out The Nest last season when it opened (like my fellow LaLaScoop co-founder did), I am sure that you were blown away then. But now, you’ll have the additional option to cozy up in their open cabana like areas and obtain your reservations with greater ease through the app RESY, along with a beautiful space to hang while you wait in the lobby; cocktail in hand of course. Book your wedding, special occasion, cooperate reception, or just get your friends together for an amazing experience at The Nest!